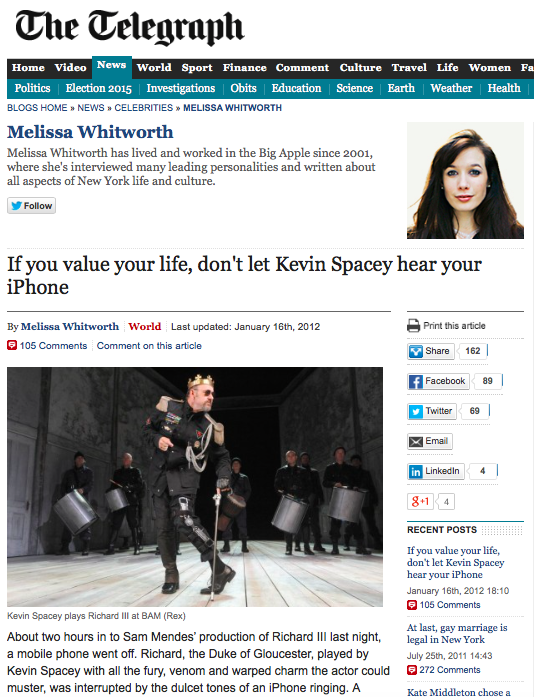 About two hours in to Sam Mendes’ production of Richard III last night, a mobile phone went off. Richard, the Duke of Gloucester, played by Kevin Spacey with all the fury, venom and warped charm the actor could muster, was interrupted by the dulcet tones of an iPhone ringing. A woman rifled madly through her handbag, and then muttered audibly that she didn’t know how to turn it off. It rang on and on. A ripple of terror washed over the audience members sitting in row J, and beyond, not because the only thing that can make an otherwise civilised theatre-goer go postal is the interruption of a pivotal scene by the digital rendition of Beethoven’s "Für Elise", but because Spacey will go positively bonkers if he can hear it too. In Sydney, when the same thing happened during a ten day run of Richard III, Spacey broke character, unravelled from the hunched pose of the Duke of Gloucester as effortlessly as he turns from the deformed “Verbal” into Keyser Söze at the end of The Usual Suspects, and yelled from the stage, "Tell them we're busy!" The next night, he shone a laser pointer at some audience members who he could hear rustling and whispering. At the Brooklyn Academy of Music, where I saw the play, ushers admonished cellphone users before the curtain had even gone up. We were told that if anyone was caught using the cameras on their phones the play would stop immediately and we’d all have to go home. It made for a tense audience experience, even before the Duke had started his murderous quest for the English throne. Apparently he had silenced his phone but an alarm had gone off instead. On Twitter, the composer Daniel Dorff wrote, “Changed my ringtone to play #Mahler 9 just in case.” A YouTube video superimposed a marimba sound over a performance of a piece by Leonard Bernstein. As Spacey completed the gruelling three and-a-half hours on stage, he was breathless, sweat-soaked and bloodied. Mendes has the actor hoisted up by his ankles by a cable after he’s killed on the battlefield, and Spacey hangs, swinging slightly, high above the stage. The audience was silent at last.